Dreamworks is back with their latest offering Home. Sadly, it is a fumble for the studio. The alien race the Boov are a species that are constantly on run from their mortal enemy The Gorg. They are led by Captain Smek (Steve Martin), hailed for skills in cowardice. Smek has led his people to a new planet: Earth and relocates the population to Happy Human Town so they can 'liberate' them. Oh (Jim Parsons) is an outcast of his people despite his need to please and becomes a fugitive when he accidently sends an e-vite to Gorg. Tip (Rihanna) is a young girl who was the only human to escape the Boov's relocation and ends up meeting Oh. The pair have to team up to stop The Gorg receiving Oh's e-vite and find Tip's mother (Jennifer Lopez). 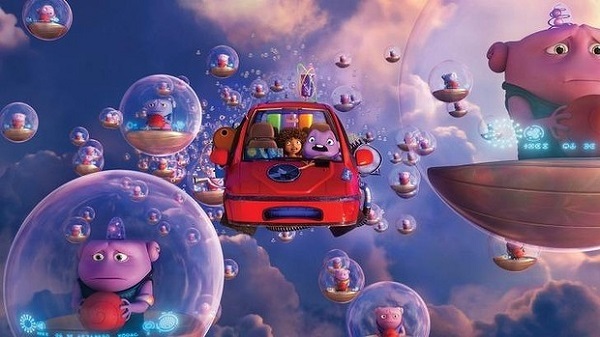 Home is a movie geared for a younger audience and the humor is based around slapstick, toilet jokes, cultural misunderstanding and sometimes a combination of style. The humor is harmless enough, Tip's threats of violence notwithstanding, but there are no real stand-out moments. Pig the obese cat does provide some cute little moments, mainly because he acts as a normal cat and a strange species to Oh, but Pig is described as a 'him' though the cat is the calico and calicos are almost always female. It's a very minor issue, but I like to address it. Other ways the childish tone is brought out is through its use of language with the Boov speaking with a broken form of English, with Oh saying things like 'Can I come in to the out now?' and Captain Smek refers to his symbolic scepter as 'The Shher'. Oh's technical prowess results in him making a flying cat using equipment from a convenience store, making a colorful creation with slushy machines and uses food as projectiles. 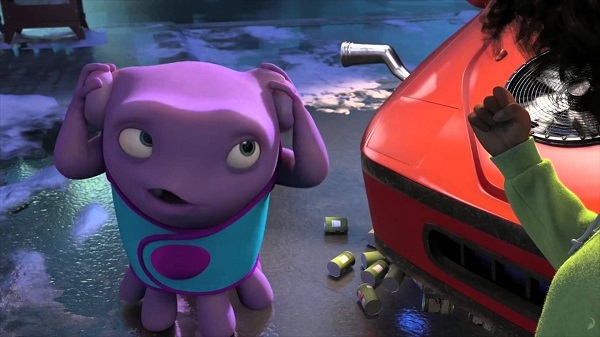 Despite the threat to Earth and the Boov from their moral enemy, Home is very light-hearted movie. It is more focused on the mishaps of Oh and his friendship with Tip than the danger that could be upon them. Tip is highly emotional because her mum has disappeared and she is grieving over her, watching videos on her laptop and phone: but unlike a Disney film which will tackle the themes of loss and death, Tip's mum is still alive. Home attempts to have an emotional heart, having themes about friendship, family and individuality throughout, with Oh searching for acceptance and belonging and Tip wanting stability with her mum being the only constant in her life. When talking about their families, Oh reveals that that the Boov are not looked after, but are a family unit, just in an unloved collective so he has no concept of what a mother is. At the end of the movie, there is a reveal which connects to the family theme. Director Tim Johnson tries to pull at our heartstrings with these themes including a moment where no character can be heard speaking and left to the visuals: but Home does not have the gravity that the How to Train Your Dragon series and Kung Fu Panda 2 had. The score uses a choir singing a chorus of hmm as a shortcut for emotional moments. Jim Parsons, best known as Sheldon from The Big Bang Theory is again playing a character with poor social skills with a lack of understanding of social interactions. But Sheldon holds humanity with the exception of Stephen Hawking and his Meemaw in utter contempt, Oh is good natured, just too eager to please - leading to other Boovs trying to avoid him. He is the best voice in the movie. Parsons' co-star on the other hand was just terrible. Rihanna gave a very stiff performance as the girl who is having to deal with Oh as she searches for her mother. The emotion for the character had to come from the animation because it could not come from her voice. With this movie and Battleship to her name it might be best for Rihanna to stick to her pop career. Rihanna also supplies a lot of music for the soundtrack. Steve Martin as Captain Smek is like child-friendly version of Zapp Brannigan, an inept commander who somehow has a heroic reputation and claims credit for the work of his subordinates. 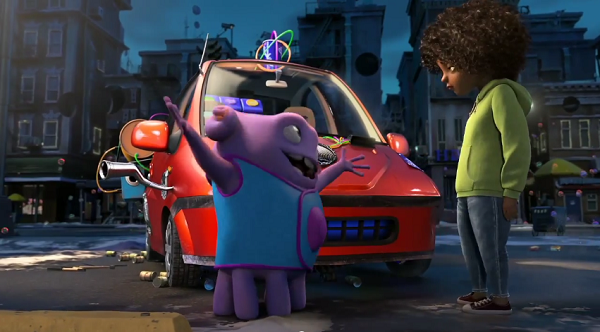 For a movie like this we are hardly expecting Shakespeare level writing, but the script for Home is very mechanical. The plotting is so predictable that you need to be under the age of eight to not see the route Home is going. The 'twist' of the movie is pretty much revealed early on and it is very formulaic flick. Like other Dreamworks, movies the animation is of a high standard. Though the Boov has a simplistic look, there is detail with their skin textures and the human characters have features like Tip's freckles. There is a lot of skill to art for Earth with cities being recreated and Earthly landscapes explored, but the alien spaceships and their facilities are very spartan in their design. 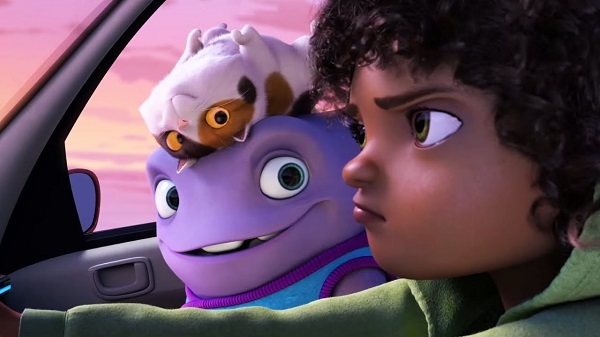 Home is a harmless movie that has good intentions behind it, but is a very inconsequential movie from Dreamworks and it will go down as one of the studios weaker recent entries.